Recently, Apple introduced two new models of iPhone that have been improved in quality and features. These two iPhones, i.e., iPhone XS and iPhone XS Max have been designed to perform more activities than other previous models released. However, it is impossible to deny the fact that they may face certain risk which will require a reset. The question then is: how do we reset a newly introduced iPhone without compromising its quality. In this article, we are more interested in how to reset iPhone XS/XS Max/XR. Below are four important things that will be discussed. Part 4. Which Method Should I Use? Bonus Tip: How to Reset iPhone – When I Forgot My Passcode? One of the common known ways to reset an iPhone is the hard-reset method. It is always very easy to do because all it requires are just phone buttons. iPhone XS/XS Max/XR is not any different in the hard-reset protocol, and the steps to do that will be described below. Step 1: Press and release the top volume button. Step 2: Press and release the low volume button. Step 3: Press and hold the button by the side.”. Step 4: Release when an Apple logo shows up on the screen. After doing these four things, your iPhone turns back on and has been reset. >> Why Do You Need to Hard Reset iPhone XS/XS Max/XR? Sometimes, your iPhone may be acting up because of some external or internal issues. It could probably be frozen, and the easiest way to fix that is by doing a hard reset to enhance its performance. >> Is It Bad to Hard Reset iPhone XS/XS Max/XR? It isn’t totally bad to hard reset your iPhone; however, you should know the solution was just temporary, and the underlying software issues could still resurface. Also, there is the risk of getting software files corrupted at the same time. Resetting iPhone from Settings is otherwise known as Factory Reset which is a master reset. It totally wipes out everything from the device and frees it temporarily from bugs and other issues. All personal information and data which have been saved on the device memory will be cleared, making it appear like a new iPhone. Step 1: Go to Settings from Home. Step 2: Tap on Reset from the list. Step 3: Select the option to Erase All Contents and Settings. Step 4: Input the phone passcode and confirm to restore to factory settings. Step 5: Wait for the Phone turns off and then back on ready for use. However, this may not totally wipe out issues with the device as the reset is only temporary. >> What Will Happen When You Reset from Settings? When you reset from settings, what practically happens is that: all personal information and saved data on the device becomes wiped off. Also, all network settings, activated modes, and personalized profiles become erased making the device look brand new. It is a master reset that returns the iPhone XS/XS Max/XR to manufacturer mode, i.e. empty and ready to be used afresh. Taking a good look at all the reset methods above, it is obvious that all reset done on the iPhone are just temporary and may even cause further problems. It is then necessary for us to consider a reset procedure that will permanently fix all issues and return the device into good shape. This is only possible with the use of a reset/repair tool called iMyFone Umate Pro. It completely erases all data, including private data and ensures they are never recoverable. Even though some files have been deleted from the device, they are not entirely removed; it finds them and deletes them. Private fragments of third-party app are removed from the device without being traceable. With One-click cleanup, all data and hidden caches, junks, temp. files are deleted instantly. 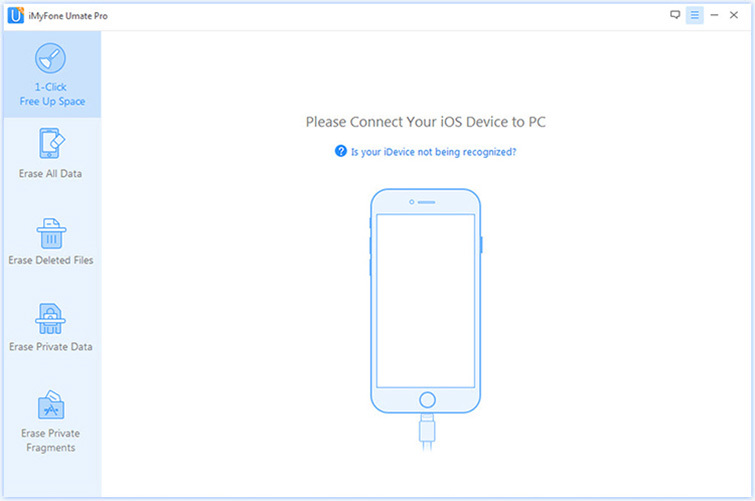 Step 1: Connect your iPhone to a Windows PC or Mac via a USB cable. 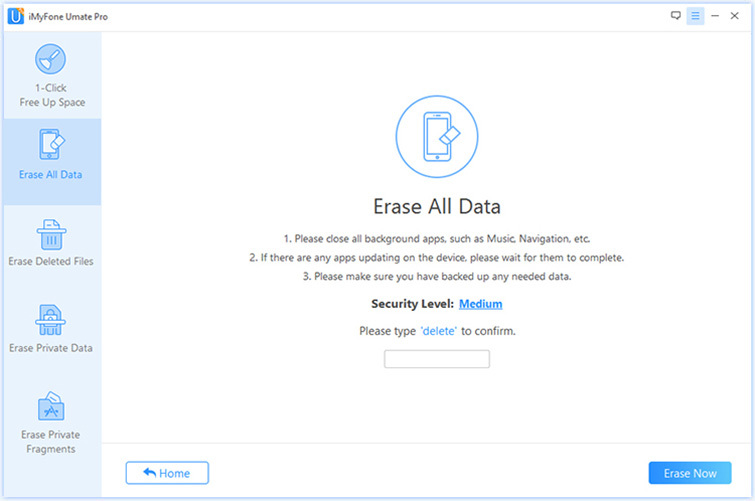 Step 2: Once a connection has been established, it is very important to choose an Erase mode which is the “Erase All Data.” Click the icon “Erase” to start. Step 3: There are 3 erasing levels, but the preferable one is the Medium Level. Step 4: After doing all these, click on the Erase Now button and watch all files deleted permanently in a few minutes. After all data is erased, your device becomes as fresh as new, and you can now start afresh with the use. Having regarded all the methods to reset above, it is important to state out clearly the best method for you. You are advised to pick depending on the issues you are facing with your iPhone. 1. If your iPhone is just frozen, doing a Hard Reset or Reset from Settings would probably be easy. 2. However, if it is something worse than that, the use of a repair tool like iMyFone Umate Pro is advised to ensure maximum protection. 3. Or if you forgot your passcode of your iPhone, then we still have a Bonus Tips for you, please keep reading on the next part. How to Reset iPhone – When I Forgot My Passcode? 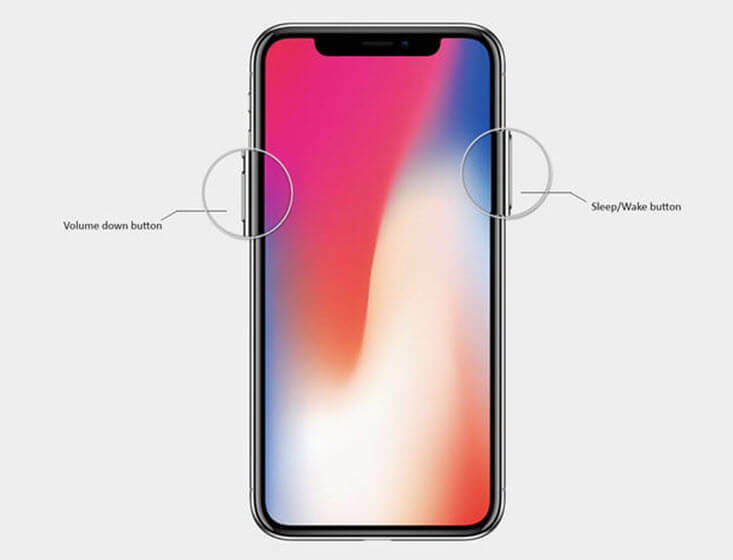 There may be situation that you forgot the passcode of your iPhone XS/XS Max/XR. What should you do? Is there any ways to reset your iPhone and start all over again? Yes, there comes help. 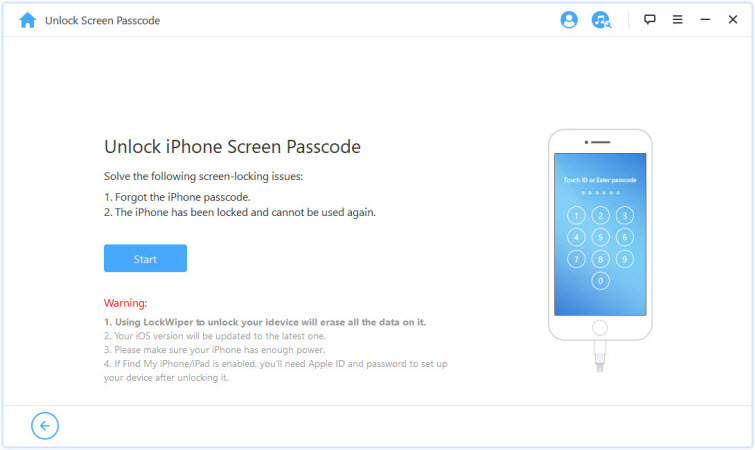 You can get help from an unlock tool called iMyFone LockWiper, which can help you unlock your iPhone in just few steps within minutes. It can help you reset your iPhone XS/XS Max/XR easily when you forgot your passcode. 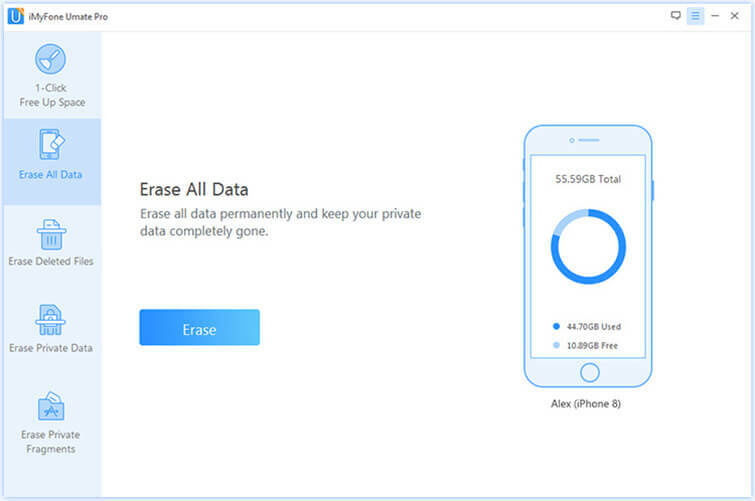 It will help you reset your iPhone to the latest iOS version and erase all the data on your iPhone. It also supports iPhone/iPad/iPod Touch with locked, disabled, broken screen. It can unlock 4-digit / 6-digit passcode, Touch ID & Face ID without any hassle. Step 1: Connect your iPhone XS/XS Max/XR to the program. 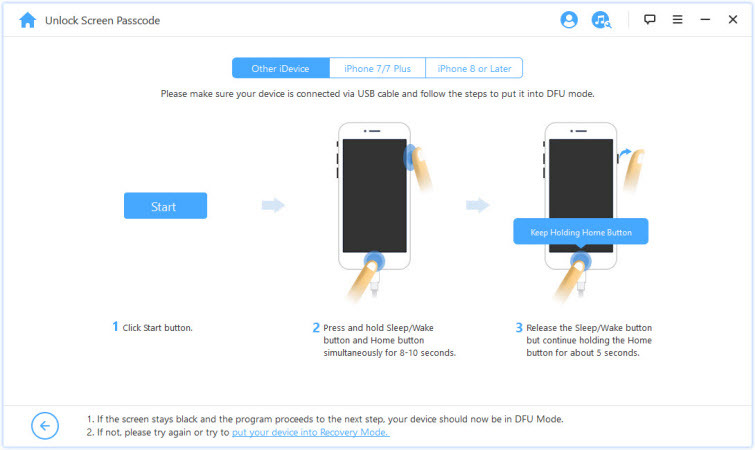 Step 2: Put your device in the DFU/Recovery Mode. 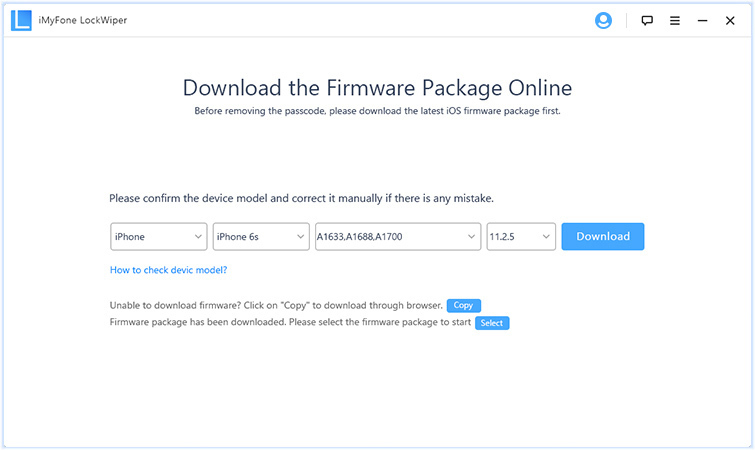 Step 3: Download the firmware for your iPhone. Step 4: Verify the firmware and unlock your iPhone. In conclusion, it is always possible to have your iPhone misbehave, but you don’t need to panic anymore if you can identify the issue. Identifying the issue brings up possible solutions and often times, a reset is all that is required. 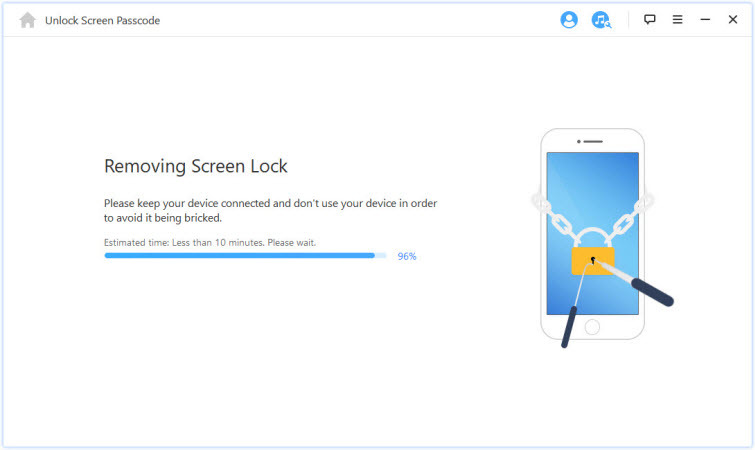 Pick any of the methods on how to reset iPhone XS/XS Max/XR above (iMyFone Umate Pro is advised or LockWiper when you don't know the passcode) and enjoy quality use of your device.